I’m very excited to announce that I’ve been invited as a guest designer and critic for VCFA’s MFA in Graphic Design’s spring residency this April in Montepelier, Vermont. I’ve long admired many of VCFA’s inspiring guest designers, and am humbled to now be included on that list. On Thursday, April 11th, I’ll be presenting Graphic Design as Symbolic Counterpower, a visual essay and discursive presentation that examines the social and political role of design. It argues against design’s supposed neutrality and objectivity to show how power is deeply embedded within design theory and practice, providing a framework for a lot of my thinking about contemporary graphic design. I look forward to presenting it and receiving feedback that will surely further my thinking. If you happen to be in Vermont, the lecture is open to the general public. I will also be participating in critiques of student work, visiting the exhibitions, and attending various other activities during the week. More details on the residency and its public events can be found here. In the wake of the terrible white supremacist attack in New Zealand/Aotearoa last week, we’re releasing a set of anti-racist poster designs for download, online sharing and printing. 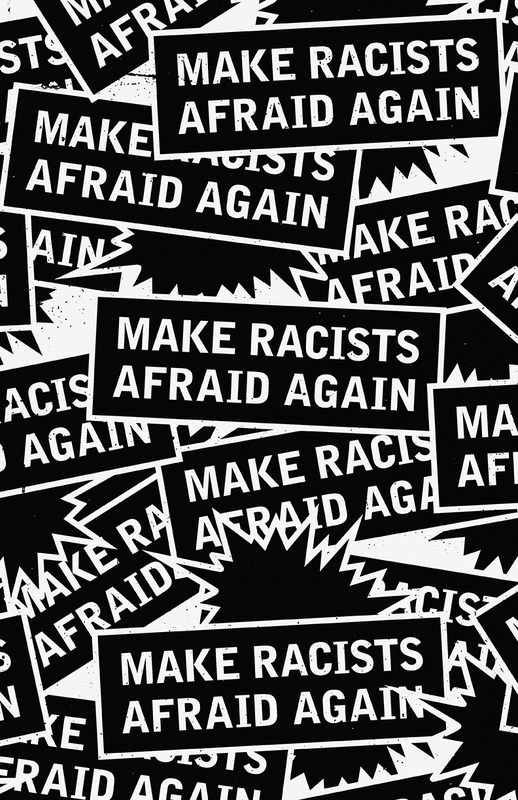 Many of these designs were/are part of broader campaigns against fascist organizing, islamophobia, anti-migrant policy, anti-indigenous and anti-black racism, and we encourage people to continue to support these fights and to build a common front against white supremacy and racism in all its forms. In Solidarity, Love and Rage. LOKI is honoured to have designed the posters and visual identity for the upcoming Protests and Pedagogy conference/event series that marks the 50th anniversary of the infamous "computer riots" at Concordia University. Drawing from amazing archival imagery we aimed to create a visual language that conveys the militant energy of the protests and occupation, acting as a contemporary intervention into the institutional space. The conference kicks off on Jan. 29! Check out the inspiring line up of events on their website and we’ll have full documentation of our design work soon. Please note that the studio will be closed between December 17, 2018 and January 7, 2019. We wish you a joyous and restful end of the year, and we look forward to working together again in the future. All power to the people! And all the very best to you! Happy end of the world… oops… year! And what a year it’s been! LOKI turned four in October, and we’re proud to have worked on many challenging projects addressing urgent issues facing our communities over the years. We’ll be closing up shop for the holidays next week and wanted to take the opportunity to give heartfelt thanks to all of our clients, collaborators, friends, and accomplices. Thank you for supporting our work. In anticipation of the year to come, we’ve put together a quick cut of some of the projects LOKI has put out. We’re actively looking for new collaborators in 2019, so if what you see sparks interest, don’t hesitate to get in touch. The video was edited by our intern Andira Hernandez-Ramdwar, and scored with a track from our friends Loosestrife. On December 4th, we’ll be helping to present an important research-action project on racial profiling by police in the Saint-Michel neighbourhood of Montréal. The event takes place at Concordia University and will feature presentations by Fo Niemi of the Centre for Research-Action on Race Relations, Alexandra Pierre of la Ligue des droits et libertés, and the youth researchers involved. The research report was created in deep collaboration with youth in the community, highlighting their voices and often very difficult experiences. All props to them!!! The report and social media campaign feature illustrations by Maylee Keo and design strategy by LOKI. LOKI is excited to announce that Kevin will be presenting at the Design Thinkers Conference in Toronto on Oct. 24 as a member of the Design for Social Good panel alongside Jay Wall from Rally Rally and Dawn Hancock of Firebelly Design. How can designers thoughtfully and ethically engage with social, environmental and political issues through design? How do you set up a project for success? What are the emerging trends in this field of design, and what are some critiques? Kevin will also be leading an “intimate” roundtable discussion on the same topic on the 25th (registration required). For a backgrounder, please see our Design Against Design research and our Graphic Design as Symbolic Counterpower visual essay. We’re very much looking forward to these conversations with our colleagues and to meet other socially-engaged designers. Hope to see you there! Last week, our long-standing client/collaborator Cinema Politica launched their Documentary Futurism project, an inspiring programme of 15 short films “documenting that which has yet to occur.” Inspired by Afro-futurism and Indigenous futurism, the films inaugurate a new genre that blends documentary cinema with the speculative arts. We were honoured to have our Make Racists Afraid Again poster included in L'Humanité's Tenir l'affiche initiative which featured a daily political poster to celebrate the 50 year anniversary of May 68. Many thanks to Thomas Lemahieu for reaching out to us and putting together such an inspiring project. See all the posters here. The 20th Allied Media Conference took place on the Wayne State University campus in Detroit. Last weekend LOKI took Design Against Design to Detroit for the 20th annual Allied Media Conference. We are thankful to have been able to speak to designers with similar practices based in social change/social justice. It was uplifting and inspiring to find ourselves in a design space where the conversations revolved so easily around the how-to's of doing the activism, the life, and the running of a studio — all with little resources and huge demands. We spoke with the aim of demystifying design practices and showcasing work that functions as/supports social-political resistance. We also critically questioned the current positioning and language of social innovation design, which we see as a gentrifying force towards our activist design practices. LOKI is very excited to be presenting the opening session of the Design Justice track at this year's Allied Media Conference! The strategy session we are proposing, Design Against Design, will pull together case studies of selected work alongside broader research and thinking on oppositional design practices. We will also present a critique of contemporary social innovation practices that co-opt the language of grassroots activism and design theory, often towards blatantly neoliberal ends. It is our hope that the session will inspire the collective development of more genuine ways of speaking about and working through socially-engaged design practice, forge new networks, and build some much needed momentum against the growing conservatism of the discipline of design, and culture at large. Looking forward to seeing everyone in Detroit!